Boyhood is the latest film from Richard Linklater, the director behind the critically acclaimed Before trilogy. It is most well known for its impressive production design: the film was shot over the course of 12 years with the same set of actors, allowing us to see their characters grow up along with the actors portraying them. But beyond its technically impressive accomplishment, the film is also exceptionally emotional and intelligent. It's a movie that both brought me back to my childhood and got my thinking about what defines our generation. It is an accomplishment which all audiences ought to be able to enjoy. Early in the film, a young Mason asks his father, "There's no real magic in the world, right?" After watching this film, I'm not so sure about that. There might not be any elves alive right now in the world, but there is Richard Linklater's Boyhood, which is not only my favorite movie I've seen this year, it's my favorite movie I've seen for more than five years, and even then it feels like apples and oranges. It's a movie that could have gone wrong in so many ways (what if they needed to reshoot a scene from the boy's childhood after the actor had already grown up? ), but somehow manages to make its incredible 12-year-production experiment the least impressive of its feats. It's unimaginably difficult to talk about this film objectively. As a young man less than a decade older than Mason ends up, I saw more of myself on screen than I was ready for. I never had a delinquent biological father or an alcoholic stepfather, but in different ways I went through the same struggles as Mason. Finding yourself. Finding your friends. Finding your purpose. I can't emphasize enough the level of realism and emotion this supposedly artificial world takes on. With a few exceptions, it keeps the action and drama limited in order to show the developments in between the traditional milestones of life—going on your first date, graduating from high school, etc.—and thereby keeps the story generalized and relatable. The result can feel anticlimactic if you're used to big dramas with clear story arcs, but for me it created an environment where there was never a single moment which felt contrived. 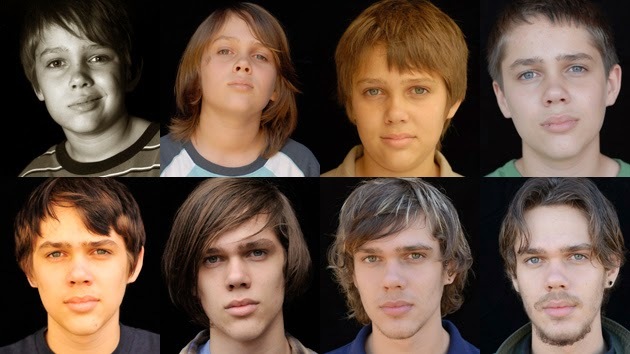 Life has no story arc, and Boyhood's ambling narrative structure helped mimic that feeling. There are things I know for certain outside my sentimental reaction to the film and beyond the impressive dedication required to shoot for twelve consecutive years. Patricia Arquette is an absolute show-stopper, and just as without her support Mason wouldn't have been able to succeed, without her presence the movie wouldn't have been the immersive experience that it was. Linklater's continuing collaboration with cinematographers Lee Daniel and Shane F. Kelly also features a gorgeous variety of perfectly orchestrated shots, whether tracking, close-up, or otherwise. As if the film's incredible breadth both in terms of its production and the scope of its story were no hindrance, it also develops a wealth of thematic issues. At the center is the plethora of ways which we attenuate the immediacy of our everyday lives, whether through the dampening effects of drugs, the safety net of technology, or plain psychological-emotional distancing. Life is a scary thing since we only get one and it's easier to mess up than push forward, and we do a lot to displace this fear of failure. At one level these filters for reality are necessary to avoid becoming overwhelmed (as Mason Sr. is when the film begins), but it's just as easy for their use as a crutch to worsen the weakness they make up for (Professor Welbrock). But the film does even more than capture the life of a single boy and the issues he faces, it captures the life of a generation. Through its focus on the culture of the era, it presents the world and the way it was for over a decade. Each period in the boy's life features music distinctly associated with its respective period in time. We see the evolution of technology and our ways of relating to it. We see the development of the political climate and the shifting taste in popular media. We see the world turn and witness the beauty of its growth. Over the course of its nearly 3-hour runtime, Boyhood takes on a lot of material, not all of which it covers with equal depth. It touches on several topics without stopping to say much: we see homophobia, bullying, and terrorism, none of which receive the same treatment as the wider themes and issues it does confront directly. Some of the side characters abruptly float in and out of the story without much ceremony. But even here I think this is not only necessary, but meaningful. By presenting these larger cultural matters but dwelling longer on the smaller details in between them, the movie achieves what other great films from Magnolia to Days of Heaven have: it takes a particular subject and makes it universal. This is the type of film that makes me love film as a storytelling medium. It shows us the world without judgment, and in doing so it reaches toward life's biggest questions. It marks the most emotional, magical experience I can remember ever having in a cinema, and for that I am eternally grateful. See the rest of my reviews for the films of 2014 here.